Sacroiliac joint syndrome is a significant source of pain in 15% to 30% of mechanical low back pain sufferers. 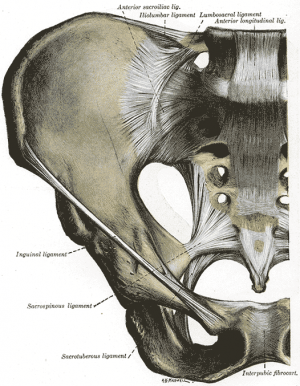 The posterior sacral ramus of the spinal nerve is the main nerve that innervates the sacroiliac joint. Mechanical dysfunction of the sacroiliac joint results in more pain and decreased mobility. The symptoms are often described as pain over the posterior aspect of the joint. The pain varies in its degree of severity; it can be referred to the groin, over the greater trochanter, down the back of the thigh to the knee, and sometimes down the lateral or posterior calf to the ankle, foot and toes. Sacroiliac joint syndrome occurs when the sacroiliac ligaments are damaged or torn by age causing too much play in the joints. This causes an inflammation of the joint making it possible to disrupt. Degenerative changes need to be considered as well. Traumatic incidents such as motor vehicle accidents, falls landing on the buttocks, and cumulative injuries, such as lifting and running, are the most common causes. It occurs more frequently in older people, but there is too little research done to substantiate this conclusion. Sacroiliac Joint Syndrome is a condition that is difficult to diagnose and is often overlooked by physicians and physiotherapists. The sacroiliac joints are located on each side of the spine between the two pelvic bones, which attach to the sacrum. Multiple structures are involved in the support and movement of the sacroiliac joints. The ligaments which contribute to this synovial joint are the anterior and posterior sacroiliac ligament, interosseus ligament, sacrotuberous ligament, sacrospinous ligament and iliolumbar ligament. The joints are surrounded by some of the most powerful muscles of the body, but none of these have direct influence on joint motion. The main function within the pelvic girdle is to provide shock absorption for the spine and to transmit forces between the upper body and the lower limbs. It is often hard to determine exactly what caused the wear and tear to the joints. One of the most common causes of problems at the Sacroiliac joint is a trauma. The force from these kind of injuries can strain the ligaments around the joint. Tearing of these ligaments leads to too much motion in the joint and over time it will lead to degenerative arthritis. Pain can also be caused by an abnormality of the sacrum bone, which can be seen on X-rays. Pregnant women have a greater chance to develop sacroiliac joint syndrome. Female hormones are released during pregnancy, relaxing the sacroiliac ligaments. This stretching in ligaments results in changes to the sacroiliac joints, making them hypermobile. Sacroiliac joint syndrome is a controversial diagnosis, therefore pain and injury to the sacroiliac joint is commonly overlooked. This condition is often listed under the general term dysfunction, a term that serves as a collective term for different conditions. Important to notice: the sacroiliac joint syndrome is not a synonym of sacroiilitis! Physiotherapists use a variety of orthopedic provocation tests. The diagnosis can be conclusive if at least one of these tests is positive. Besides the known provocation tests: Gaenslen Test, Sacral Thrust Test, Thigh Thrust test, Compression test and Distraction Test, there are also the Yeoman's test, Faber test (Patrick Sign), Gillet test, Laguerre test and the Sacroiliac Stress Test; described below. Yeoman's test: The patient is prone with the knee flexed 90°. The examiner raises the flexed leg off the examining table, hyperextending the hip. This test places stress on the posterior structures and anterior sacroiliac ligaments. Pain suggests a positive test. Gillet test: The examiner’s thumbs are placed under the posterior superior iliac spine and S2. The patient is asked to stand on one leg while moving the opposite leg towards the chest. If the joint side that is flexed moves up, this is considered a positive test. Laguerre test: The patient lies supine and the examiner flexes, abducts and rotates the patients affected joint. The pelvis must be stabilized and pain signifies a positive test. This test differentiates hip pain from sacroiliac pain. Sacroiliac Stress Test: The patient lies supine. The examiner exerts anterior pressure on the iliac wings with both hands. By crossing his or her hands, the examiner adds a lateral force to the compression. Pain is a sign of strained anterior sacroiliac ligaments. CT and MRI are often used to confirm the diagnosis. Isolated lumbar stabilizing muscle training. Specifically for stabilization exercises, it’s recommended to begin in a quadruped position. The physiotherapist can manually guide the spine through the full arc of flexion and extension. It’s essential to tuck in the chin and hollow the abdomen by tilting the pelvis posteriorly. Lift one arm slowly while continuing to maintain the neutral position of the spine, without changing the natural curves; return the arm and then continue with the other. The lumbar multifidi can be palpated medial to the lumbar facet joints bilaterally; this allows the physiotherapist to avoid changes in muscle activity of the long spinal extensor muscles, ensuring that the patient is performing the exercise correctly. The next exercises are isometric co-contractions to be performed with the addition of heavier external loads to the lumbar spine: bridging and single-leg extension in quadruped. Single-leg extension from quadruped can provide further challenge with alternating arm/leg extensions. To increase the complexity and the load of these exercises, single-leg bridging and the bilateral bridging exercises can be performed with the lower extremities on an unstable base of support such as a Swiss ball. Finally an example of an exercise to improve coordination is single-leg bridging with alternating lower extremities on an unstable base of support. Alternating the stabilizing lower extremity on the Swiss ball further challenges coordination and balance while improving the stabilization capabilities of the core musculature. The tension of a pelvic belt is comparable to the muscle activity of the transversus abdominis (and the obliquus internus abdominis) muscle. Transversus abominis has an anterior attachment on the iliac crest, an ideal place to act on the ilium producing compression of the SIJ in combination with stiff dorsal sacroiliac ligaments. A minimum contraction of 30-40% of the maximum voluntary force of the transversus abdominis is sufficient to achieve stability of the pelvis according to Richardson et al. No greater contraction is needed to achieve joint stabilization because the lever arm of the transversus abdominis is almost equal to the lever arm of the pelvic belt. There is also no significant change of stability by increasing belt tension from 50 to 100 N, but if the belt is placed in too low of a position, it may lead to a small decrease of laxity. Greater belt tension isn’t recommended secondary to the potential of skin pressure and discomfort. Kamali, F., Shokri, E., The effect of two manipulative therapy techniques and their outcome in patients with sacroiliac joint syndrome. Journal of Bodywork & Movement Therapies, 2011. Sacroiliac joint and lumbar manipulation was more effective for improving functional disability than Sacroiliac joint manipulation alone in patients with Sacroiliac Joint Syndrome. Spinal high-velocity low-amplitude manipulation may be a beneﬁcial addition to treatment for patients with SIJ syndrome. History and physical examination can enter Sacroiliac Joint Syndrome into the differential diagnosis, but cannot make a definitive diagnosis of Sacroiliac Joint Syndrome. Treatment options for Sacroiliac Joint Syndrome include physical therapy, orthotics and manipulation. It is important to notice that there is only a small amount of research available about the Sacroiliac Joint Syndrome. Further research will be a great contribution. A Sacroiliac Joint Syndrome is a condition that is often overlooked by physiotherapists. It is often listed under the general term “dysfunction”, but this syndrome has to be differentiated from other sacroiliac joint disorders. To get a clear view of the Sacroiliac Joint Syndrome, further research has to be done in the future. Pelvic Physiotherapy - to Kegel or Not? This presentation was created by Carolyn Vandyken, a physiotherapist who specializes in the treatment of male and female pelvic dysfunction. She also provides education and mentorship to physiotherapists who are similarly interested in treating these dysfunctions. In theLoE presentation, Carolyn reviews pelvic anatomy, the history of Kegel exercises and what the evidence tells us about when Kegels are and aren't appropriate for our patients. ↑ MORRIS E. C. Low Back Syndromes: integrated clinical management. The McGraw-Hills Companies, 2006. ↑ 12.0 12.1 SEIDENBERG P.H. 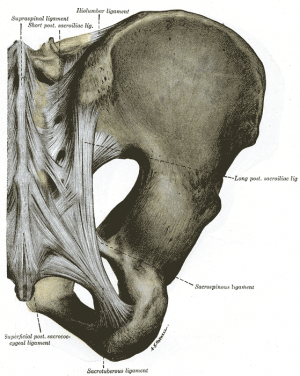 The Hip and Pelvis in Sports Medicine and Primary Care. Springer, p. 140, 2010.